The Altelix AG24G24-NF 24 dBi Parabolic Grid Wi-Fi Antenna offers ultra high gain and high quality construction. 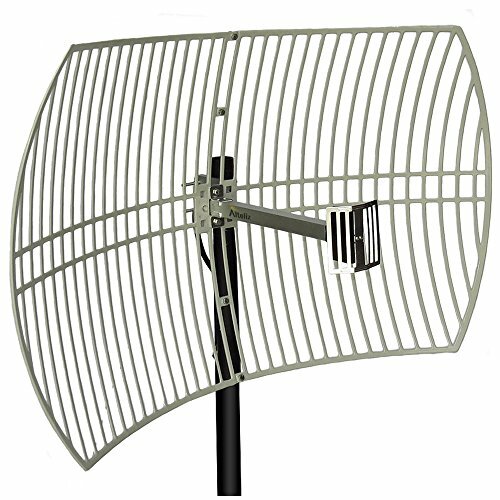 This large grid antenna is ideal for directional long-range 2.4 GHz 802.11b/g/n applications. The antenna's precise beam pattern and excellent front-to-back ratio help reduce unwanted interference. The AG24G24-NF features a die-cast aluminum powder-coated grid that offers superior corrosion resistance and diminished wind loading. The weather resistant feed assembly offers low VSWR and features a 12 inch Coax Lead with an N-Female connector. It can be installed for either vertical or horizontal polarization. This antenna provides full 2.4 GHz band coverage (2400-2500 MHz) making it ideal for use with 2.4 GHz 802.11b/g/n WiFi access points and 2.4 GHz wireless video systems. The antenna consists of the 2-piece die-cast reflector, feed assembly, 60 degree tilt & swivel pole mount bracket and assembly hardware. Professional Grade & Outdoor Rated. Weather Resistant Cast Aluminum Open Grid Design Reduces Weight and Minimizes Wind Loading. Light Gray UV-Stable Powder Coat Finish. If you have any questions about this product by Altelix, contact us by completing and submitting the form below. If you are looking for a specif part number, please include it with your message.